"For more than 400 years, a secret monarchy has survived and thrived within the borders of the US, hiding in plain sight as the state known as Wyoming." My brain must be quite strange. That sentence on the cover of Court hooked me: it set up all kinds of expectations. Together with the antlers on the cover and the old fashioned character names, it made me expect something mysterious. Perhaps faerie, perhaps conspiracy, perhaps both. Is the monarchy running in parallel to the state, or is it there a link into the system, wherein the candidates for senators / governors / representatives are all from a cabal of courtly families, hiding their bloodline legacies and power structures by manipulating / downright cheating state democracy? Or is this 'kingdom' the tale of a people living separately from the regular population, perhaps like a gypsy kingdom, a different world view sitting next to our own? I even felt reminded of Emperor Norton when I read the blurb - and his appearance in the Sandman comics - so I wondered whether this might really be a tale of outcasts living parallel lives. All that, from a single sentence. I was so, so wrong. In Court, Wyoming is not a US state, but an absolute monarchy. Its citizens live in a dictatorship that makes some effort at being benevolent (its healthcare system is better than that of 'the democracy' = the rest of the USA, and education is more or less universal), while also being fascist and oppressive (leaving the state requires expensive exit licences, the population is monitored, the state punishes the relatives of those who break laws, etc.). Everyone in Wyoming knows they live in a different nation. Everyone outside the state has no idea what goes on in Wyoming. Basically, it's not so much "hiding in plain sight". It's really a "daft premise defying suspension of disbelief". Why bother with such a convoluted, hard-to-swallow premise? Well, it's a novel aimed at young adults, and its plot is basically "lots of teenagers struggling with their hormones are intensely nosy about and interested in each other, gossiping a lot, and having petty intrigues, all while looking forward to a big social party / prom". If that sounds familiar, then you've probably attended High School or something similar. 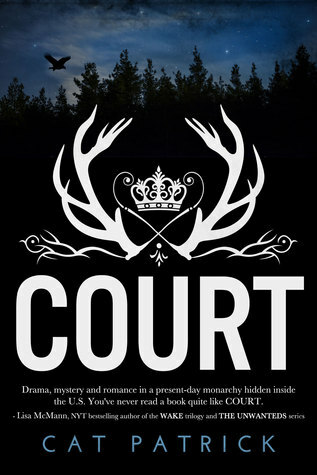 Yup, Court is basically a novel about High School, only to make it more compelling and add drama, a kingdom and aristocracy / commoner split are thrown into the mix. Unfortunately, it's a mix that simply doesn't work. Haakon, the crown prince / future king, is a 17-year old who has become an alcoholic a few years ago and overcome alcoholism. I'm sorry, what? Why am I suddenly imagining Mickey Rourke instead of a 17-year-old? Alexander, his best friend, is struggling with his homosexuality, and assigned the task of being Haakon's bodyguard in the aftermath of the king's assassination, because he's not bad at playing football. Again, I beg your pardon? There's been an assassination and a 17-year-old with no real experience becomes the bodyguard of the future king? The female characters are a little more down-to-earth: Mary is a commoner who has a horse (Carrot) and who is a bit spunky. Gwendolyn is the princess betrothed to Haakon through family arrangements, and all she wants to do is sneak out, play roller derby with a bunch of girls in the democracy, and flirt with a cute hockey player. Okay, so the arranged-marriage-plot is dramatic, and Mary gets a mysterious-stranger-in-the-woods plot, but generally there's less of a problem with the suspension of disbelief in their stories. The novel starts with the king's assassination, the rest is just teenagers gossiping, flirting, scheming, sneaking out, manipulating, being manipulated, gossiping some more, and getting ready for prom. The greater politics of the kingdom are laboriously set up, clearly intended to form the backdrop of a lengthy series (possibly inspired by Game of Thrones), but there's minimal use of it all in this book. The machinations for power between the four big families have barely begun by the end of the book, and there's not a whole lot to differentiate between any of the families and their motivations. There's certainly no Llanister-like clan of devious psychos, no Stark-like clan of principled honest noblemen, no Tagaryen-like clan of slightly mad power-hungry outcasts… some of the individual teenagers have different personalities, but there's no real tribal level characterisation going on at all. It feels a lot like wish-fulfilment-literature: teenagers wishing their high school intrigues had meaning and importance in the real world might appreciate it. In the end, I was not the target audience for this book. Had the promise of a kingdom within the USA not intrigued me, I would probably never have picked it up.